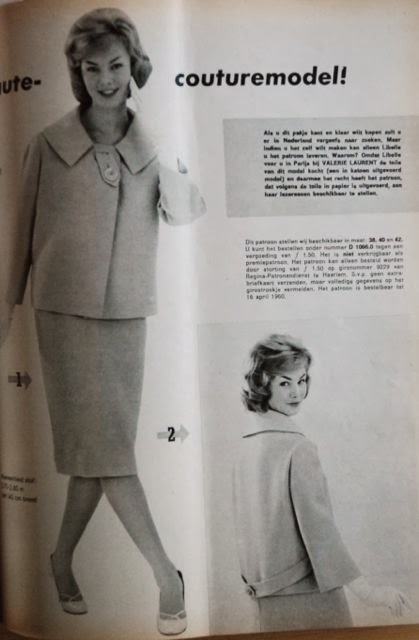 Today, I've got another vintage magazine gem for you: we're going back to the year 1960, through the eyes of the general interest reporter of Libelle magazine. 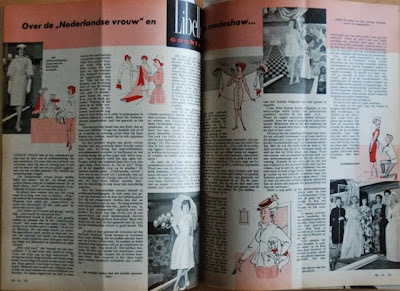 I'll try to translate her story about the style of the Dutch woman and her report of the Libelle fashion show. Before we start, you should know that Libelle started in the mid-1950's with fashion shows (I think twice a year). These shows brought the new fashion for the coming season to readers all over the country. It toured for weeks, often visiting as many as five different towns in one week. And the best of all? 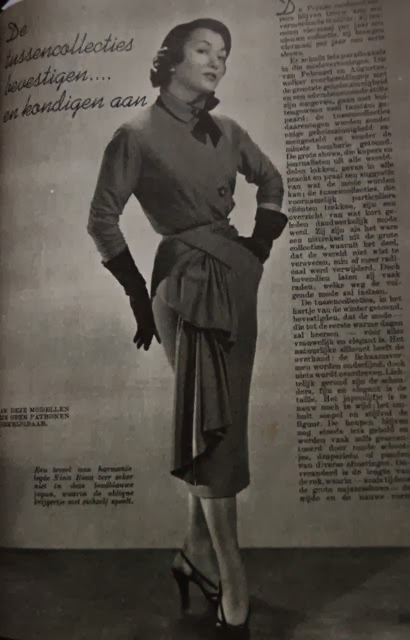 All the garments on display would be available as patterns either through to magazine itself or via sister publication Regina-Mode. 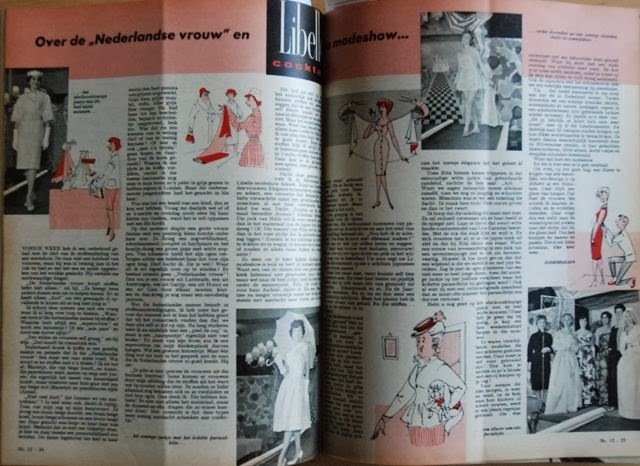 "The Dutch woman doesn't like to buy fabric on her own", he said. "They will bring two other ladies along to help them choose. And she only has the courage to buy something striking or daring if she still very young." Afterwards, I had coffee at a nice little place and pondered about this. I thought that "Dutch woman" was a rather strange type. Who would go and buy fabric with three people? I could picture it: Mary who likes beige, Ann who prefers blue/purple out together with Jenny, who would actually love canary yellow but ends up going home with a piece of beige wool (Mary) and some blue/purple silk (Ann). "Little courage" we might feel offended by that as well. It's not true either, I thought angrily. Then, my neighbor caught my eye. 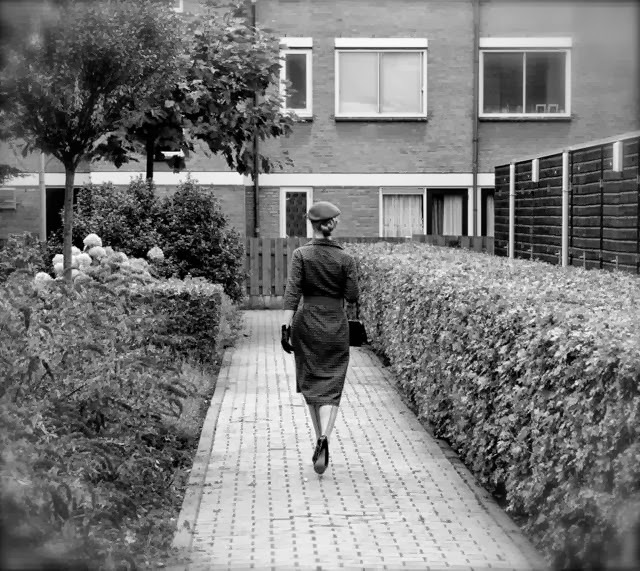 She was wearing a brown-beige coat, a brown-beige hat, brown-beige shoes and a brown-beige handbag. Her face was beige and her hair was brown. I thought a bit of orange here and there would give her personality. And the lady across from me was displaying a whole range of grey. Grey hair, grey coat etc. Everything was grey. A bit of lilac would have transformed her into a modest, elderly orchid, I thought. Was this about a lack of courage or a lack of imagination? Or did she go shopping with three people and did that confuse her? After that, I almost choked on my coffee because I suddenly remembered where I had seen such a range of grey before. In London, but that young lady had worn it with lilac-coloured hair! She was a rather pretty girl, so she could pull it off. I do remember wondering if she never clashed with her clothes though, lilac hair is a bit tricky. At that moment, a large woman entered the shop with a tiny dog under her arm. She was wearing a blinding, breathtaking suit in bright purple and the dog was wearing a green jacket with white dots. It seemed to hide its eyes behind its long hair in shame. Courage, I thought. Do you see? And why would I even care? 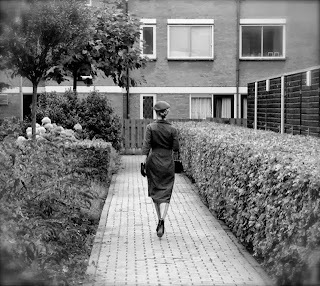 After all, there is no such thing as "the Dutch woman" ! Even if you blended women from five different places, at different corners of the country, together, you'd still end up with an incomplete picture. "It easy to point out those women who have imagination! Sometimes, women enter my department who seem to want to eat the fabrics. They would love to touch them all and devour them with their eyes. Then I think: They have imagination! They don't just see the material, they also see the thousand-and-one things they could do with it! The strange thing is that these types seem to pay little attention to ready-to-wear." 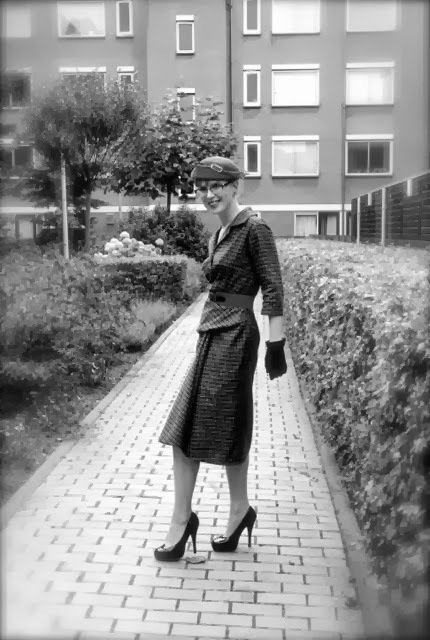 I remembered theses things when I attended the Libelle fashion show in Hilversum. I was surrounded by hundreds of women. 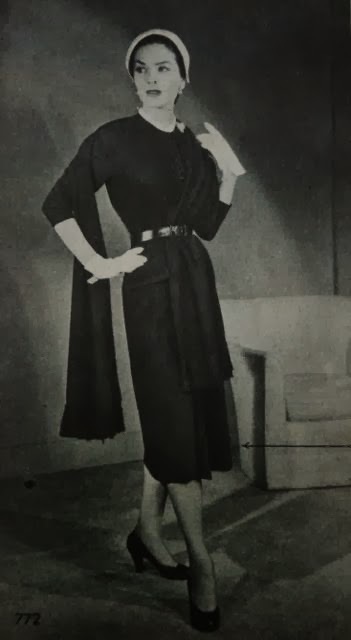 Elegant ones and sporty ones, some who were fashionable and some who had a simple style, a young woman who was expecting sitting right next to a grandmother who might have fourteen grandchildren already. I thought: Would they all be dreaming of the same things? 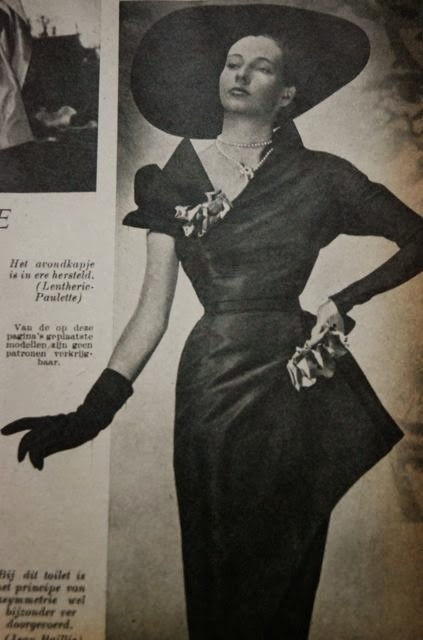 Are they all thinking: I'd love to have that dress Hilde is wearing but in the fabric of Cherie's gown? 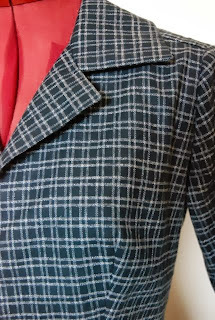 Or: That coat of Rita's is what I want, but made up in that red fabric I saw yesterday? Would they all be pondering, considering, picking and choosing, or would they just sit there and watch? Looking around at a fashion show is fun and you see people in a new way. One of the plus-sized ladies didn't eagerly watch Anita but only had eyes for the very young, very slender baby among the models, Rita. She's looking for something for her daughter, I thought. And a pale, slim and frail woman next to me bent forward with attention whenever a large size was shown. She's working on a dress for her mother, I decided. But maybe I'm all wrong. It's fascinating anyway. Also funny is the story about the lady behind me. She was enthusiastically writing down pattern numbers and then said with a bit of a shock: "Now I have eighteen! I can't make them all?" I wanted to turn around and say: "You are a woman with imagination, madam! But please, close your eyes and pick a few patterns to order at random! 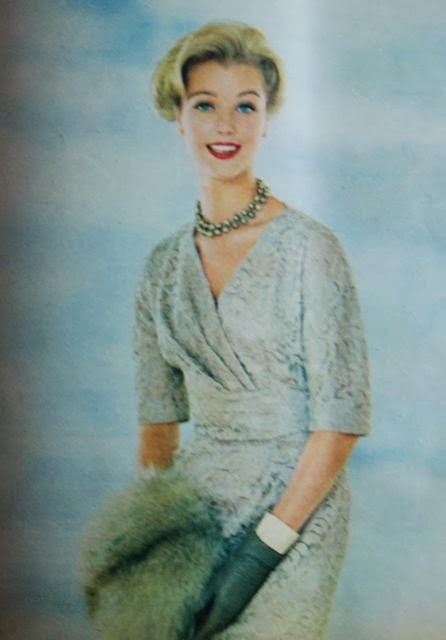 Your husband would cancel your Libelle subscription if you would try and make eighteen dresses." I didn't say it. After all, I had picked no fewer than ten designs myself. And I'm painfully sure that only one of those will get made. She goes on describing some of the designs on display and observing the other visitors. The tone is one which is sometimes patronizing and at other times full of good common sense. I think you get the gist of it though, from what I've translated. This suit was shown a lot in the magazine. It was apricot-coloured. It's a wide jacket with a belt. It's got an extended shoulder with very full set-in sleeves. The jacket is worn with a simple slim skirt. The two pictures above show two views of they same design. It's a beach outfit with a separate over-skirt. 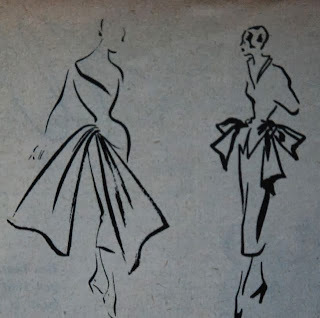 The show included designs for every occasion. Even house wear like this. It's an apron. Somehow, I never think about making a tutorial about any of my patterns until commenters start asking for it. In many cases, I can't really make one because that would basically require teaching pattern making in general. In the case of the flounce however, I think I can show you how to do this. I've never seen tutorials for a detail like this, neither online nor in pattern making books but it isn't difficult. Before we get started though, I've called this skirt detail a flounce, but is it? 'skirt with flounce' or 'skirt with draped front' I would say. I'm asking this because my blog statistics tell me some people find this blog looking for particular tutorials (so far, mainly the culotte tutorial). I'd like people to be able to find this tutorial. As said, creating a flounce like mine isn't particularly difficult. You could add one to any straight, tapered or A-line skirt. I don't recommend my version with the bloused section at the top for fuller skirts although you could make a version in which the skirt is slightly gathered and pulled up at the waistline. You know, like in the second skirt I used for inspiration. 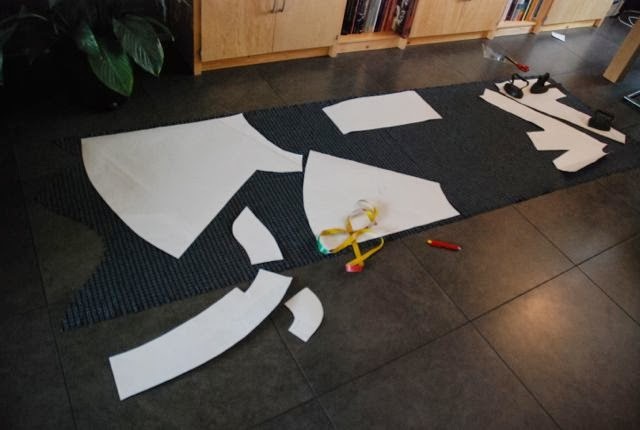 All you need to draft the skirt is lots of paper in large sheets, paper scissors, a long ruler and a pencil. 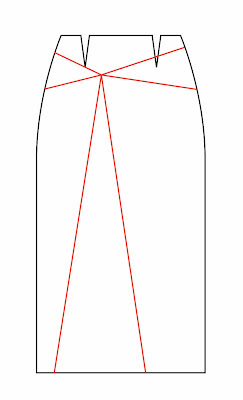 Start with the front skirt pattern piece. It's easiest to work with if you don't include seam allowance. Mark the point at which you want the center point of the flounce to be. I'd recommend putting it either at the dart position or a little bit to the center from it. 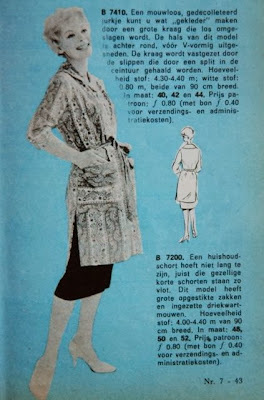 Mine was 10 cm from center front and 12 cm below the waistline. 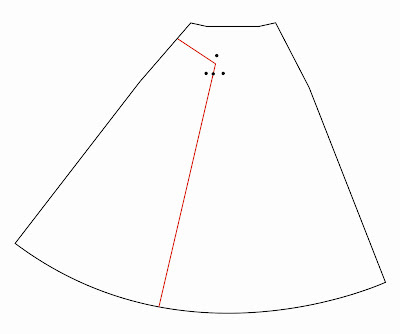 Draw lines through the point you marked as shown. Cut along the lines and spread the pieces, closing the darts. You want to create a gap of about 10 cm between the point of the top piece and those of the three bottom pieces. The pieces have to meet along the side seams. 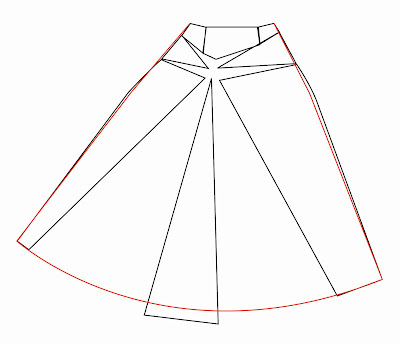 You will notice that, to create the vertical ease without opening the side seams, you have to create a wide skirt shape. Which is exactly what you want. This will create all that nice room for movement in the finished skirt. 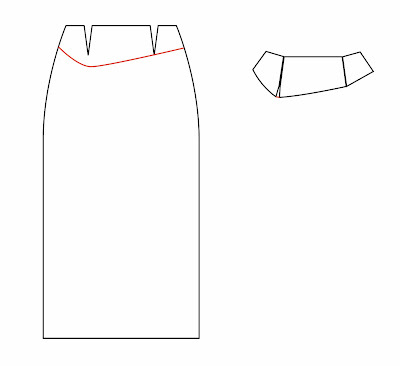 Smooth out the sides (you don't have to make them completely straight, just get the sharp edges out) and draw a new hemline. Because I wanted the hem to come up a bit at the center of the flounce, I made it a little shorter than the center piece. If you're unsure about this, just stick to the length of the pieces and draw a smooth line through those. 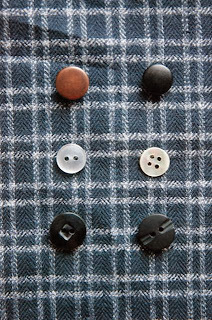 If you are using a plain fabric, or one with a random print, your pattern is now finished. Just make sure to mark top and bottom of the flounce center and the bottom left and right. 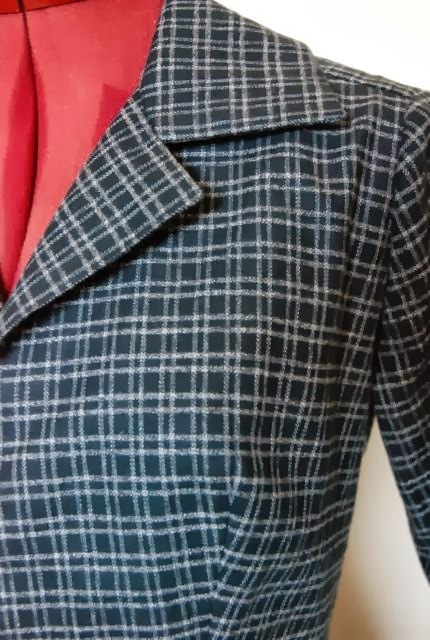 If, like me, you are using a fabric with a regular design, you may want to match it at the side seams. 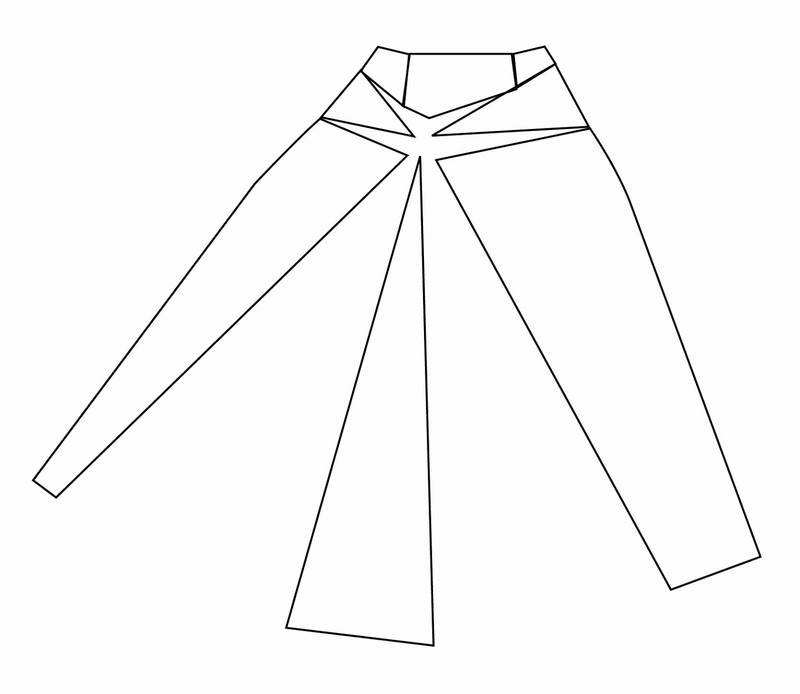 To do this, you have to split the skirt. 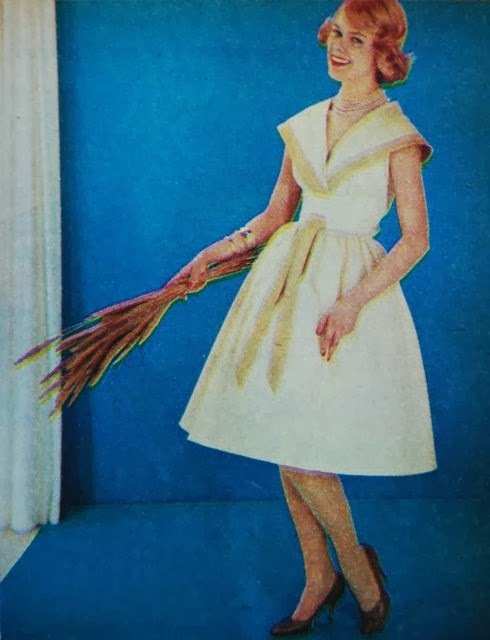 It should be something like you see in this picture, but I'd recommend making a skirt muslin, figuring out the exact position where you want the center of the flounce and drawing the lines on the muslin in places which you now know will mostly be covered by the pleats. Then, transfer the lines from your muslin to your pattern. Either way, you will need one more pattern piece: the little underlay to which you attach the center of the flounce. 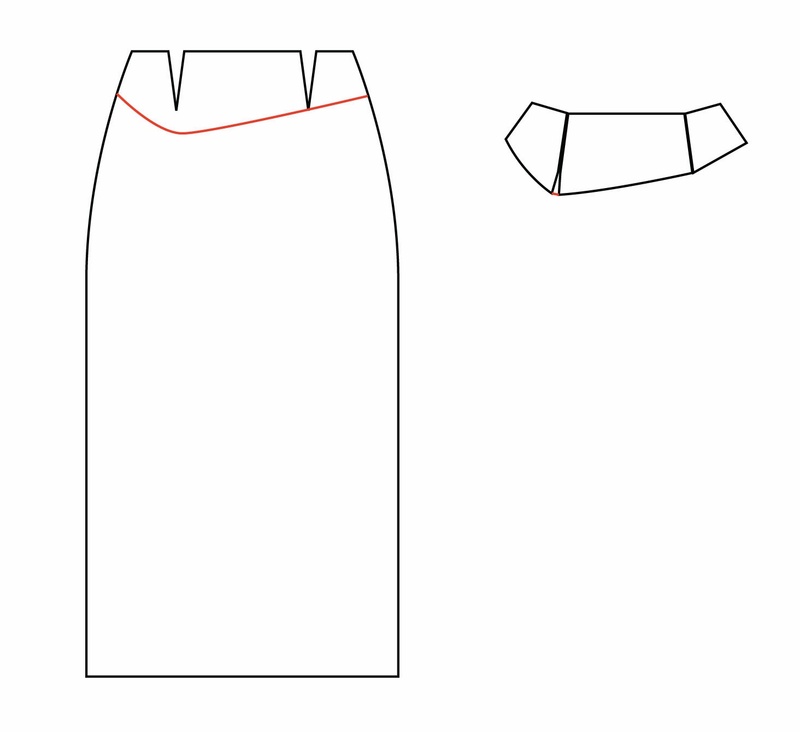 To make it, start once more with the skirt pattern piece. 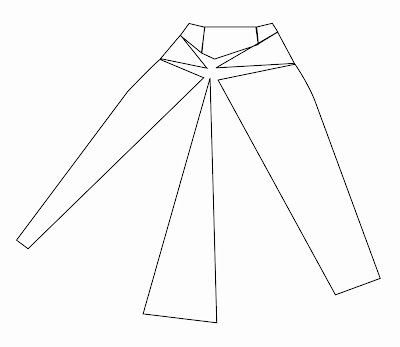 Draw in the shape you need: mine was 16 cm below the waist at the position of the flounce, tapering to 5 cm at the sides. Of course, this depends on the position you've chosen for the center of the flounce. Cut along the line and close the darts. That's all. I cut this piece from a plain black cotton. A fabric like that is a good choice: stable but thin. 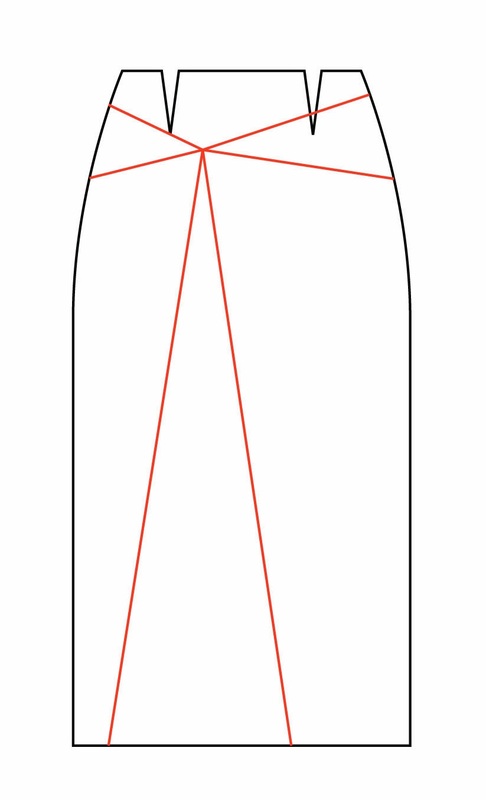 When you're sewing the skirt or dress, just construct it like you would any other skirt. The only difference has to do with the underlay: Finish its bottom first, then layer it with the front skirt itself and sew them at sides and waistline as one layer. 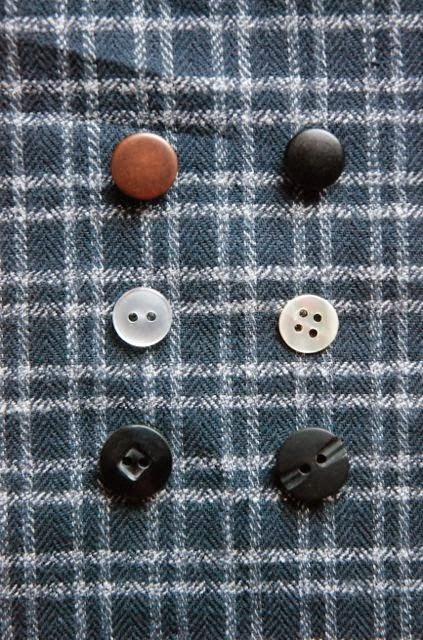 When you've put the garment together (apart from hemming), put it on and arrange the flounce. I roughly gathered the width between those left and right points and sewed that section down on the underlay at the position of the top point. You can do it differently for a different look. Play around with it and go with what you like. Just remember to check the sides. If you've done the flounce correctly, those should be straight. You can also check the hemline at this point and adjust it if you feel that's necessary. Sew down the flounce, hem the skirt and enjoy it. As usual, I hope I've explained this properly. Feel free to contact me if you have any questions and if you make a flounce skirt and post it somewhere online, please let me know, I'd love to see it. The flounce dress is finished! And I managed to convince E to put a bit of extra time into taking pictures of it. That collar is of course meant to be worn down, but I found out I could play around with putting it up. I'm really happy with the dress. Its shape turned out pretty much the way I had expected, which is, at least in my opinion, really flattering. The soft flannel makes it really comfortable (although it does stick to my stockings a bit. I think I should finally make that half slip...) and I managed to match up those checks fairly well. You may not see it in these pictures, but the front of the skirt is cut in two pieces with the seam hidden in the flounce. This allowed me to cut the side seams on the straight grain, so they could match the edges of the back skirt. The flounce is created by gathering and pulling up a part of that more-than-half-circle front skirt and sewing to a yoke-like piece of cotton on the inside. 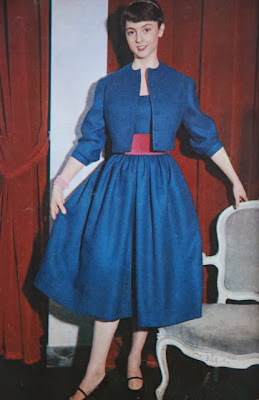 I did that when the dress was pretty much finished so I could determine how it would behave: I wanted my side seams straight and the hemline pulled up just a bit at the flounce. Oh, and obviously, this flounce provides plenty of ease for movement. 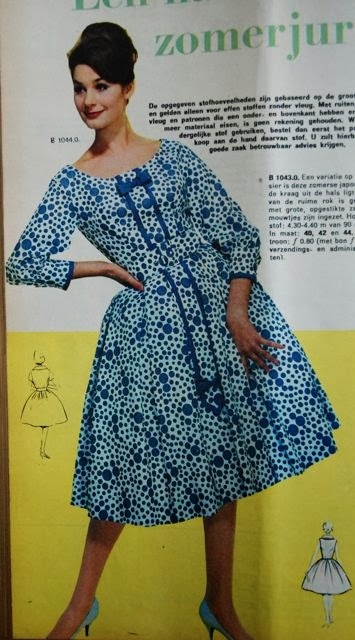 I think I could easily cycle in this dress. There's finally real progress on the flounce dress. I re-designed and re-drafted the bodice, checked if it would fit on the fabric and then made a muslin to check the fit. When I was happy with it, I started cutting. As mentioned, the fabric is only 90 cm wide and the front skirt is asymmetrical, so I had to cut the entire dress out of a single layer of fabric. Fortunately, this particular check has a very small set (repeat) so I could do some check-matching but not as meticulous as I might have wanted. And look, the lines meet at the front darts and I got them to run along the edges of collar pieces. I like that. I even spent some time looking at button options. I even looked at some bigger buttons as well. I quite like both the 'aged' copper snaps and the semi-transperant plastic ones and tried some bigger buttons as well. In the end, I'll probably go for matte black ones after all. Those won't stand out as much and after all, I want the skirt to be the eye-catcher here. Seeing the bodice like this, and trying it on, made me think of something else. I don't know whether that name was also used in English, but back in 1956, Dutch ladies' magazines new a particular style of jacket by that name. 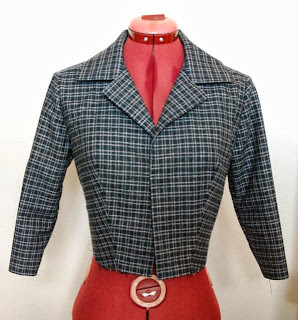 A caraco was a waist-length jacket with a semi-fitted shape. 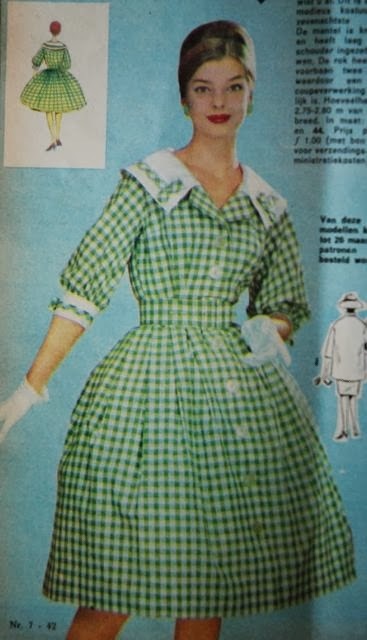 It usually had a single breasted closure, a high neckline with or without collar, no pockets and set-in sleeves, which were often less than full length. 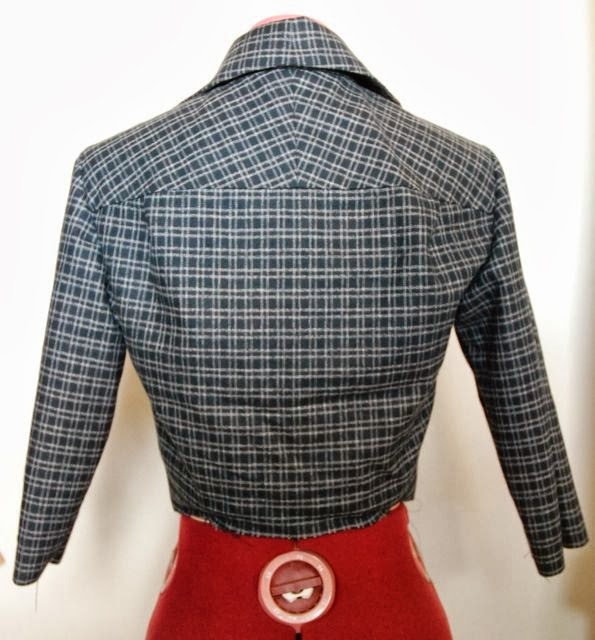 It was worn over dresses or skirts with tucked-in tops and wide, cummerbund-like belts. 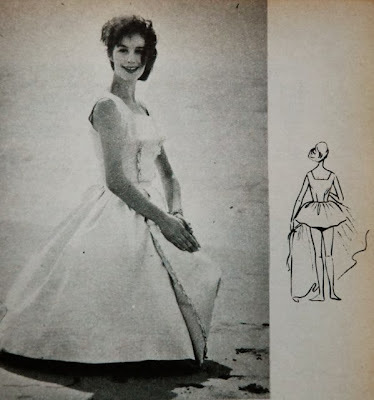 In any case, it was worn with full skirts. The caraco was quite a trend that winter. I guess it was mostly meant for young women. At least it was shown, like in the picture here, as part of the modern young woman's wardrobe. This morning, when I should be getting dressed, I tried on that dress muslin I made yesterday. I didn't take pictures because the fabric I used was a bit transparent. In general, the design worked well. It just required some little tweaks, like adjusting the elbow dart. 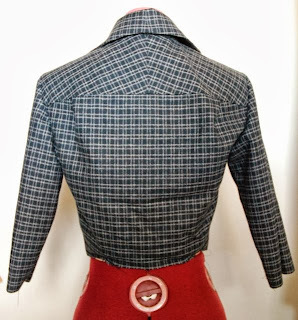 The skirt seemed really promising, especially for that check fabric. When I got home this afternoon, I was keen to start cutting the fabric. Because it was only 90 cm wide, I had to go with a single layer lay-out. There's no way I can get the other half of the bodice on there. 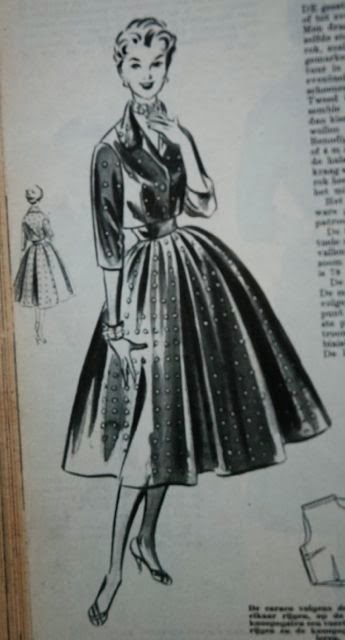 Of course, I could switch fabrics, but I was really looking forward to making that skirt in that fabric. 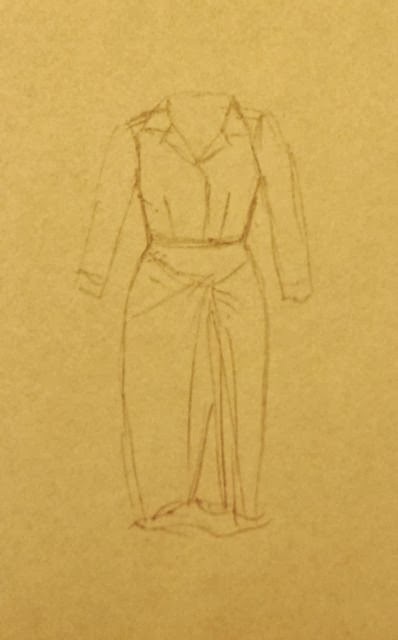 So, I spent this evening to re-doing the bodice design. Button-down front, shirt collar, set-in sleeves. It should be a lot less fabric-consuming. I'm going to try it out tomorrow. Yes, I may make more than one. There are just so many cool varieties. 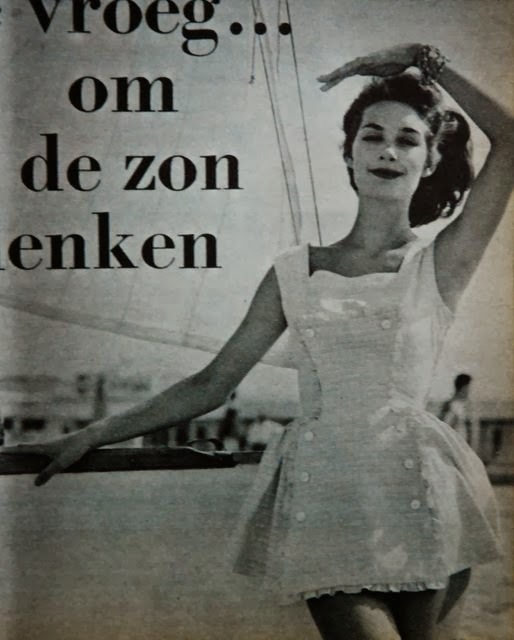 This dress, from 1951 (picture was published in Beatrijs magazine) is my main inspiration. 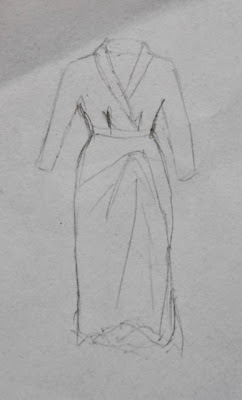 Slim silhouette, random draping at the front which causes a flounce. 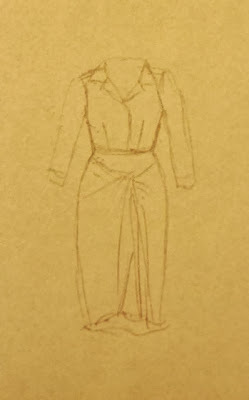 This is my design: A similar skirt shape, the same fitted kimono sleeves but a surplice front with a shawl collar rather than a shirt-like bodice. 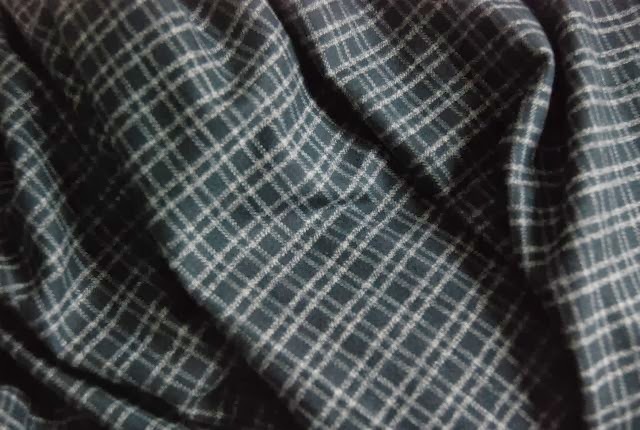 And this is the fabric I plan on using: cotton flannel with small, white on black, checks. I think this stuff will be very nice to wear when it gets too cold for cotton dresses. And it won't be too warm on all but the coldest days, like many woolen dresses. Of course, the checks present their on problems. I'm already obsessing over how and where to match them. 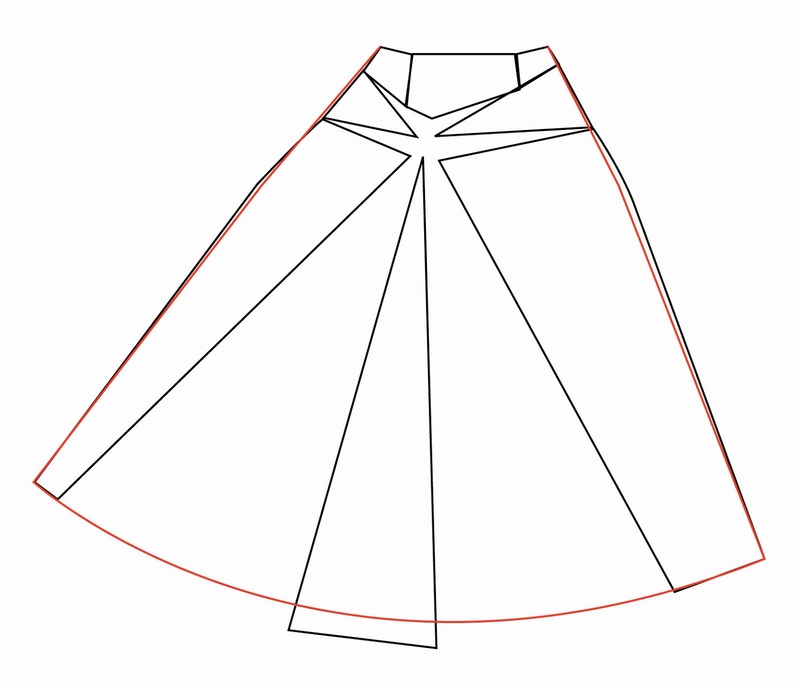 I spend some time on friday trying to drape something like this skirt, just to get an understanding of the shape. I used both an existing half circle skirt and a partial muslin I made with a pencil skirt back and different full skirt fronts. And I immediately came across a problem. On closer inspection, you can see a bit of hem sticking out on the far right, just below that horizontal tuck in the skirt. I tried to copy that only to find out it was impossible without creating some seriously wacky folds at the sides and back. There was only one explanation: this skirt is not one piece. 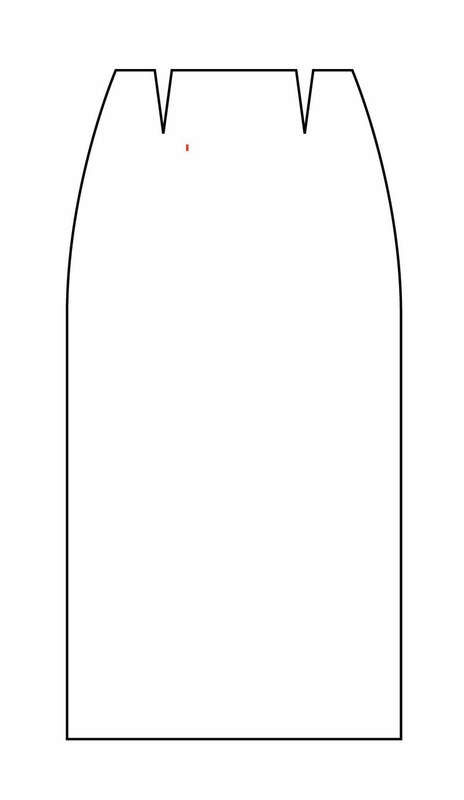 The draped bit is a separate wrap-over bit. And because of the angle of the picture, you can't see the underskirt. I could do that, of course, but it's not what I wanted. And I may not have enough fabric for it. 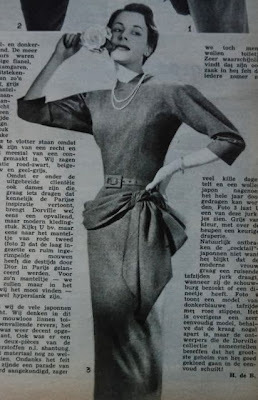 So, I decided to make something more like this skirt, although I will still try to keep the slim silhouette and the tuck below the waistline. 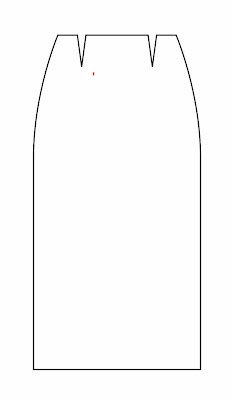 I've drafted the pattern today and was just now stitching up a muslin. I'll try it on tomorrow and tell you if it's any good. It looks like I'm developing a new obsession this autumn: retro skirt flounces. I blame all those 1950's magazines I've been reading. You may be aware of this fashion feature because Peter posted about it last year. Anyway, it was a bit of a trend in the 1950's and particular popular in 1949 and 1951. Usually the sashes in the same fabric as the dress or at least in the same colour and they are often kept in place with a belt. Sometimes tucked through parts of the skirt. 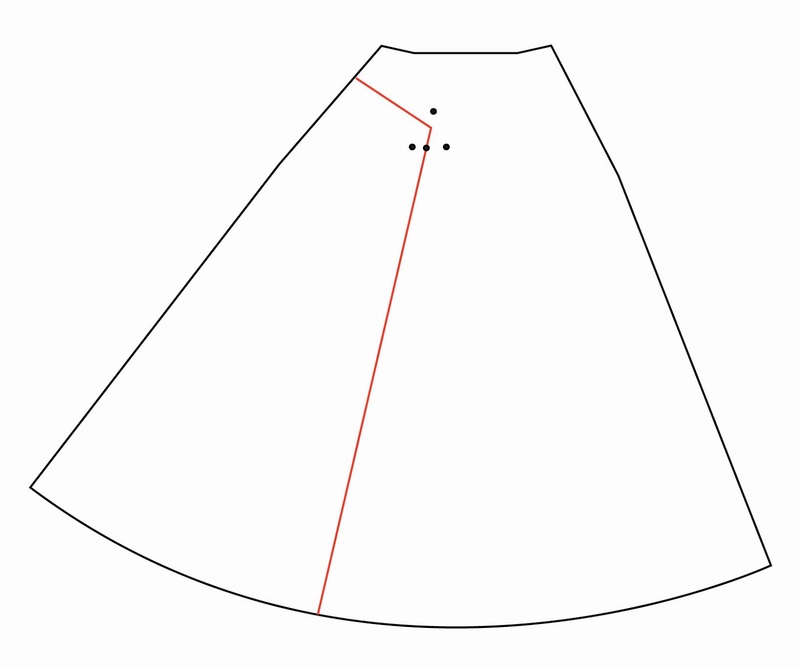 Then, there are larger separate flounces on the dress. And even apron-like bits (very popular in 1951), like the ones on the left and right in the picture below. 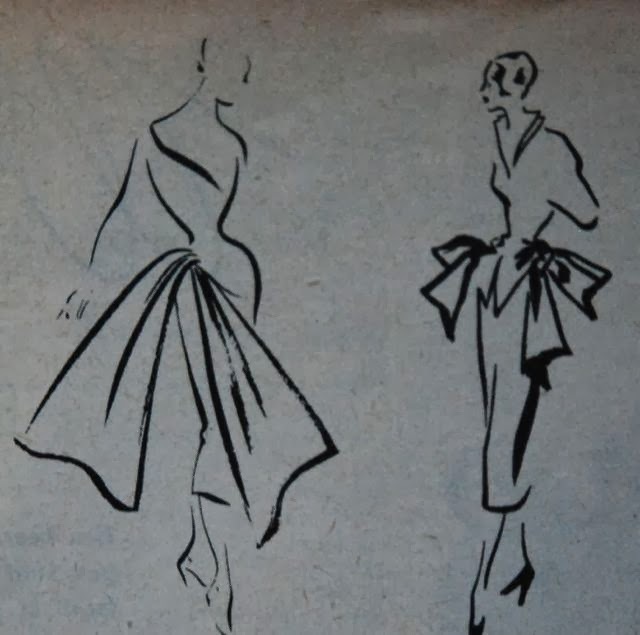 And draped overskirts, like the picture in the middle. 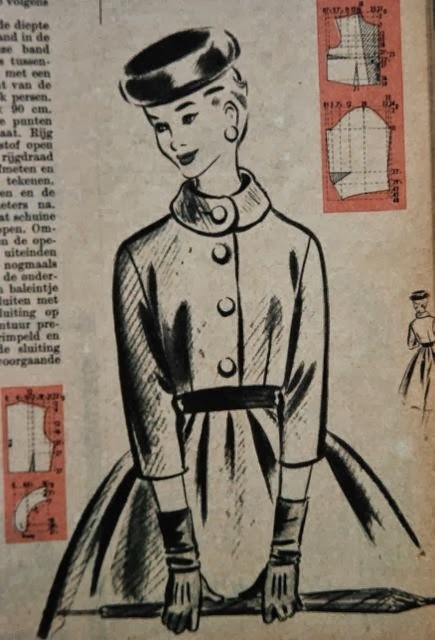 So many different options but nevertheless a number of similarities as well: Skirt flounces are mostly used on "dressy" day dresses, so the dresses usually don't have a lot of cleavage and they do have sleeves and a collar. 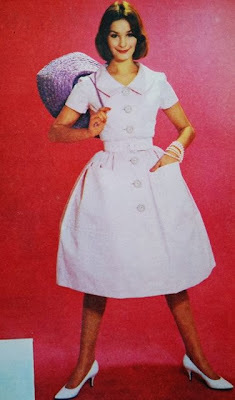 The skirt is usually a narrow one, with the flounce just being a decorative element. I would really like to incorporate some kind of flounce in a dress of this autumn. 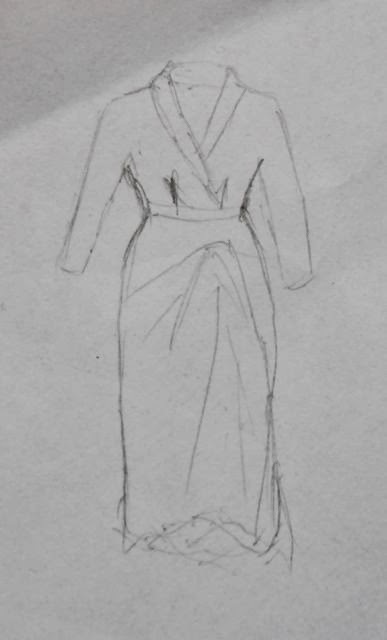 Although the sash option would be easiest, just a wriggle dress with a separate sash on a belt, I don't think I'll do that. I think I'm going to try and tinker a bit, based on the inspiration pictures in this post. 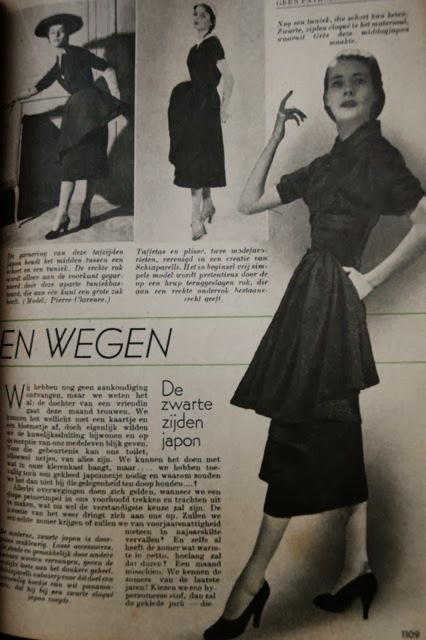 I'd like to make the flounce in such a way that it is part of the actual skirt and provides some extra room for movement. What do you think? Could a skirt flounce work for autumn/winter 2013?